The 2014-15 US – China IP Cooperation Dialogue report has been just released by the US Chamber of Commerce. The Chinese title: 中美知识产权学者对话纪要. Here is a link to last year’s report for comparison. The report was chaired by former PTO Director Dave Kappos on the US side, and Dean Liu Chuntian of Renmin U. on the Chinese side. Former judges Rader and Cheng Yongshun were also were part of the team. At our various meetings we hosted former SIPO Commissioner Tian Lipu, NCA Vice Commissioner Yan Xiaohong, senior judges from the IP courts and Supreme People’s Courts, trademark officials, academics and others. I was part of the U.S. side for a second year, and was joined by Tony Chen of Jones Day and Eric Priest of the University of Oregon. Use quality instead of quantity as the measure of innovation. Explore the possibility that a judicial interpretation be issued to ensure no injunctive threat is available until utility model patents have been substantively examined for validity. Adopt a more balanced and market-driven approach to promote innovation by entrepreneurs, inventors and universities. Improve the patent linkage system, and provide effective protection for clinical data of new chemical entities by using the ongoing effort to amend the Patent Law and the Drug Administration Law as an opportunity for change. Initiate a special study on establishing a single IP appellate court to unify China’s judicial adjudication of IP. Improve the guiding case system with respect to procedures for reviewing, selecting and releasing cases and support better adoption of case law information. Recommend research on the possibility to have a stand-alone and uniform trade secret law, in order to effectively maintain a fair market competition environment. Address new problems created by changing technology and business models; develop a good ecosystem for innovation by the interaction of law and the marketplace; and provide more market opportunities for copyright holders while dealing with piracy. I have strongly supported the Dialogue since its inception, when I was at Fordham Law School, in order to provide a de-politicized, expert and wide ranging engagement on Chinese IP issues. If last year’s report is an indication of how this year’s report will be received, it will likely be widely circulated inside and outside the Chinese government. Photos above by Mark Cohen. Top photo at Hainan Island meeting, bottom photo in Beijing at public meeting with U.S. Amb. 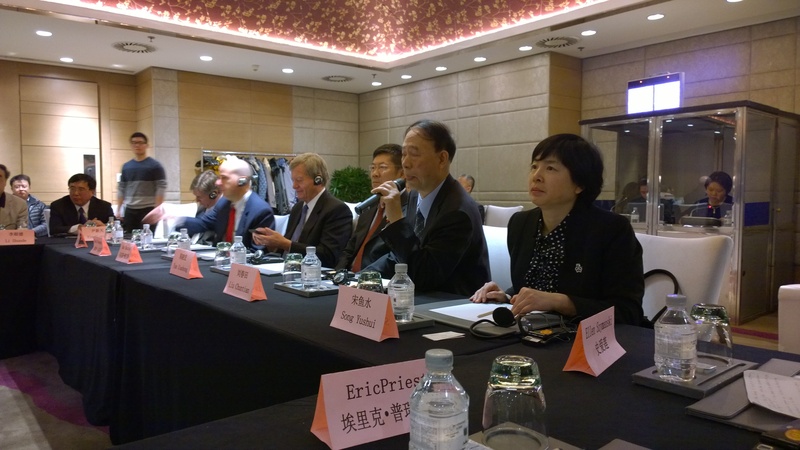 Max Baucus, US and Chinese guests and dialogue experts (both photos early 2015). This entry was posted in China IPR and tagged Eric Priest, IP Dialogue, Model Cases, patent linkage, precedent, RDP, specialized IP courts, US Chamber of Commerce, utility model patents, 中美知识产权学者对话纪要.